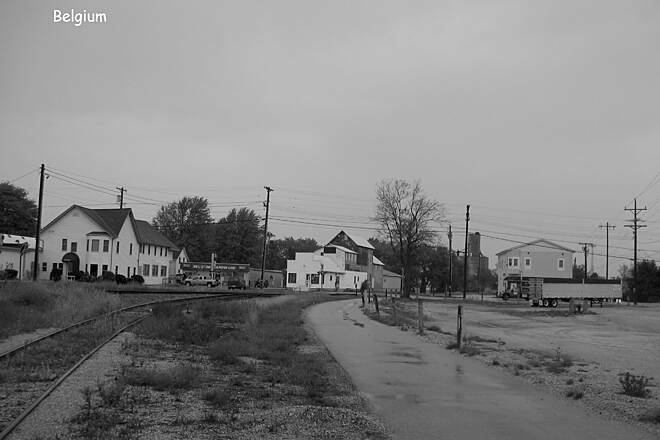 If you’re going to visit the historical communities that lie just west of Lake Michigan, why not use the former route of the venerable interurban railroad? 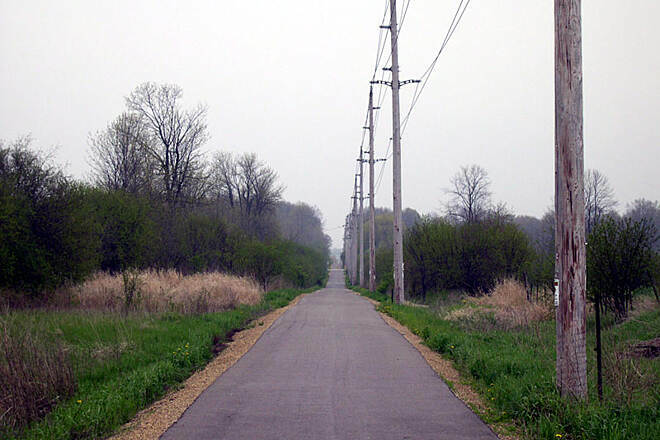 The Ozaukee Interurban Trail stretches the length of Ozaukee County and links communities known for a lighthouse, Civil War–era downtowns, surviving railroad depots and gristmills, as well as a popular 1920s recording studio for Mississippi Delta blues singers. 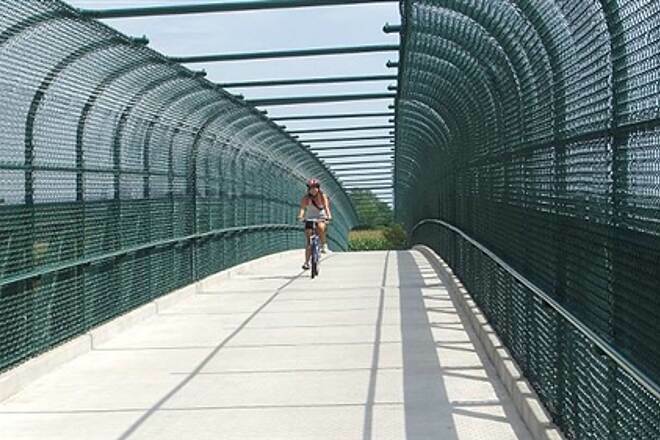 The 30-mile paved trail passes through Belgium, Port Washington, Grafton, Cedarburg, Thiensville, and Mequon. 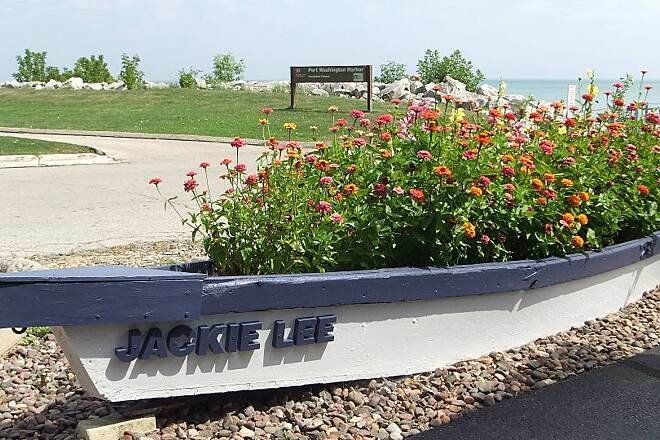 It mostly follows the route of a Milwaukee–Sheboygan interurban railway launched in 1908 and taken over in 1922 by the Milwaukee Electric Railway & Light Company as a rapid-transit line. Falling victim to the declining rail business after World War II, the owner terminated the line in 1948. 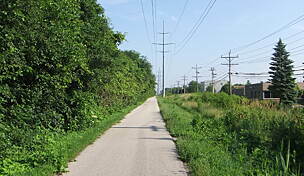 The corridor still carries the power lines, operated today by We Energies, and by 1975 a few towns used the rights-of-way as trails. The Ozaukee Interurban Trail combined these in 2002. 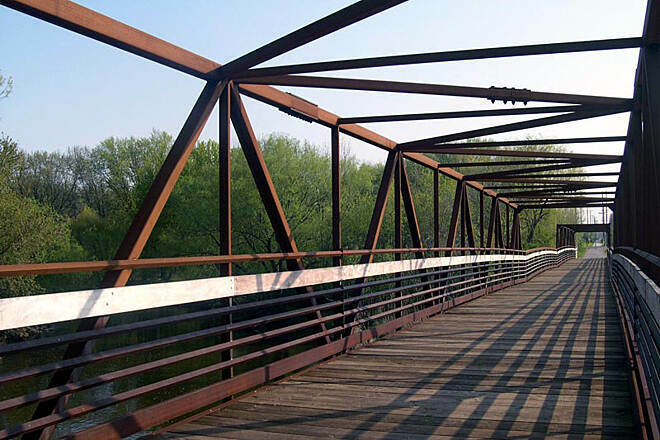 The trail connects with the Brown Deer Recreational Trail in the south and the Sheboygan Interurban Trail in the north. It runs alongside railroad tracks most of the distance. 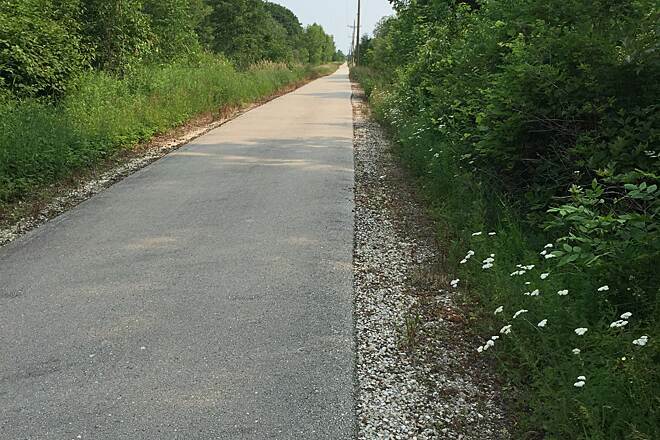 Unlike most rail-trails, this one has steeper than normal grades as it enters and leaves Port Washington. 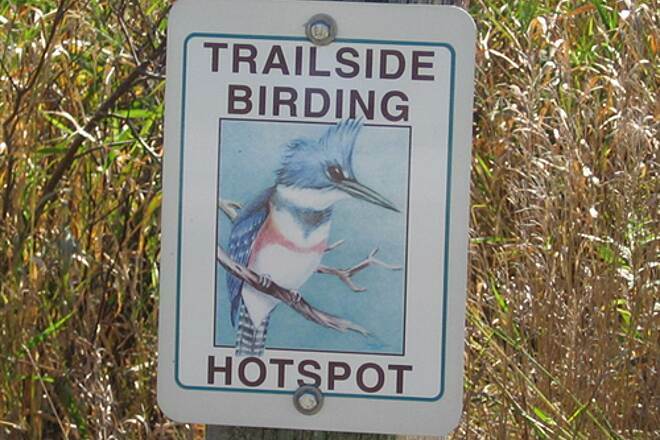 Beginning in the north at County Road K, you’ll immediately realize why the trail is known for its birding hot spots; it starts at the Cedar Grove Waterfowl Production Area, a wetland habitat for sandhill cranes, green heron, and more. 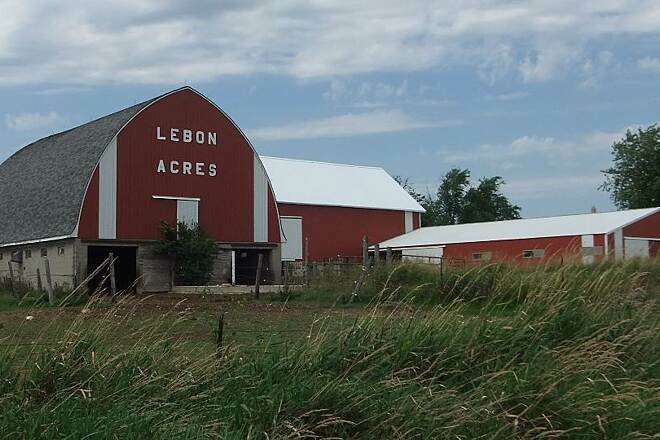 You’ll pass through the small town of Belgium in 3 miles (where the closest public parking to the northern endpoint is available at the Community Park on Beech Street) and then through another 6 miles of farm country to the outskirts of Port Washington. The trail heads downhill after you cross I-43 and arrive at the harbor on East Jackson Street. 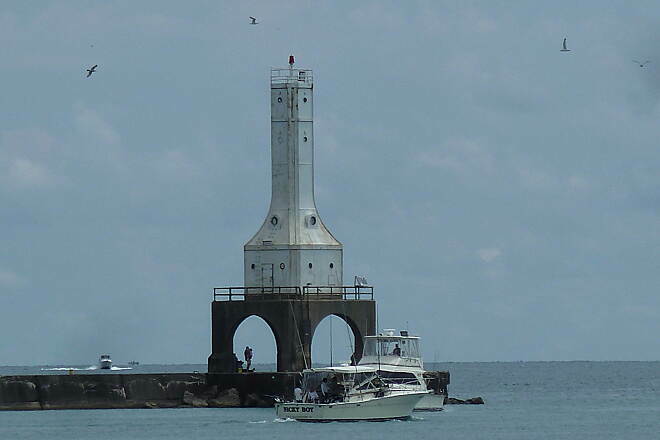 A bustling port since Civil War times and now a tourist destination, its centerpiece is the 1930s Art Deco lighthouse out on the breakwater. 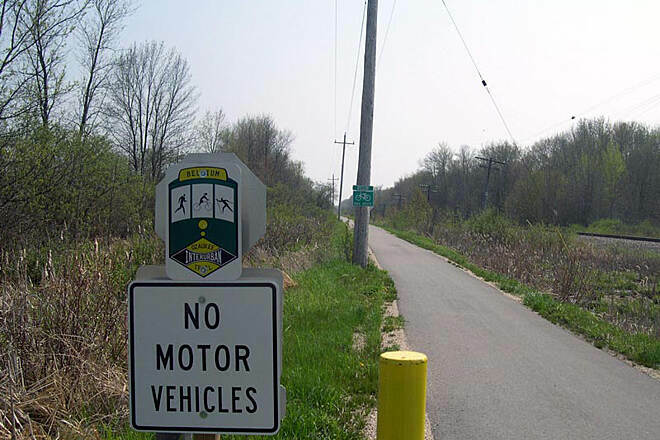 Follow the bike route signs on city streets for 1.5 miles uphill to regain the Ozaukee Interurban Trail on West Oakland Avenue between South Park and South Spring Streets. 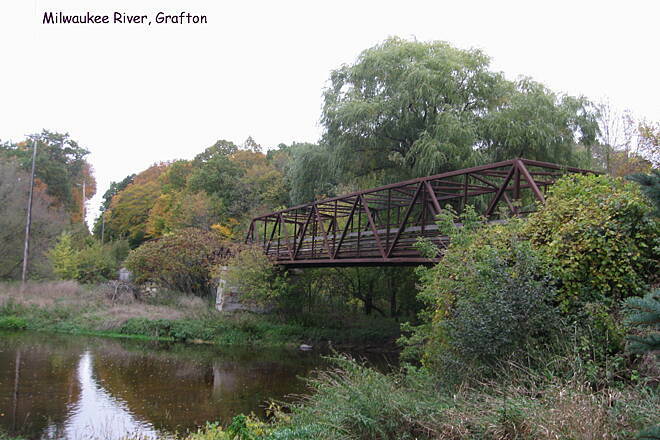 You’ll pass through open country for 5 miles until you cross the Milwaukee River and enter Grafton. 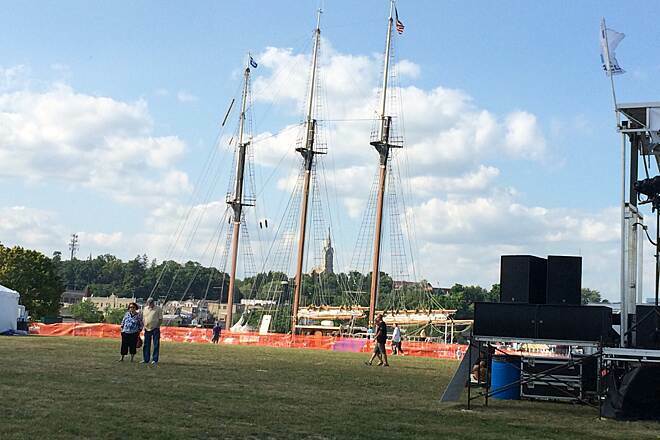 You’ll have to pass through this old mill town on a mile of city streets, too, but this won’t be a problem if you’re a music lover. In the 1920s, Grafton was home to Paramount Records, a leading recorder of early Delta blues artists such as Charley Patton and Blind Lemon Jefferson. Their music is celebrated in a statue and piano keyboard–style Walk of Fame in Paramount Plaza, located a block from the bike route on Wisconsin Avenue between Beech and Bridge Streets. 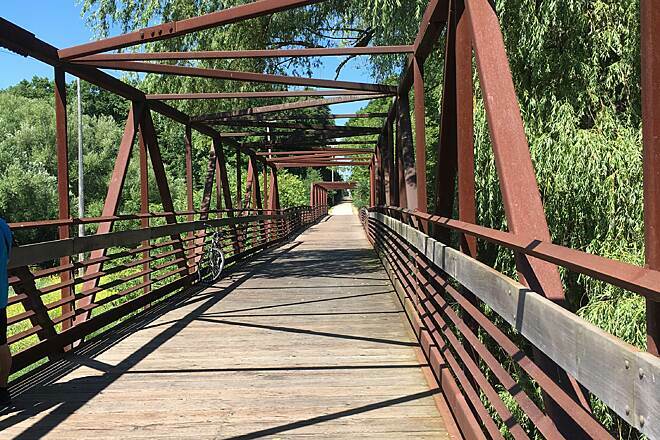 Returning to the trail on Seventh Avenue between Maple Street and Wisconsin Avenue, you’ll pass through residential areas for the next 2 miles to a restored trestle over Cedar Creek in Cedarburg. The downtown has developed a vibrant tourism economy; many buildings, such as the woolen mill, date to the Civil War era. On Center Street, watch for the cream-colored brick 1907 railroad depot; it’s the last building related to the railway on the trail. 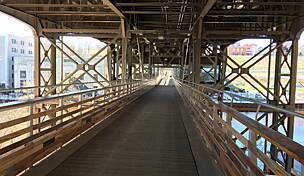 It’s about 5 miles to Thiensville, and about halfway there you’ll cross over the Union Pacific Railroad tracks. 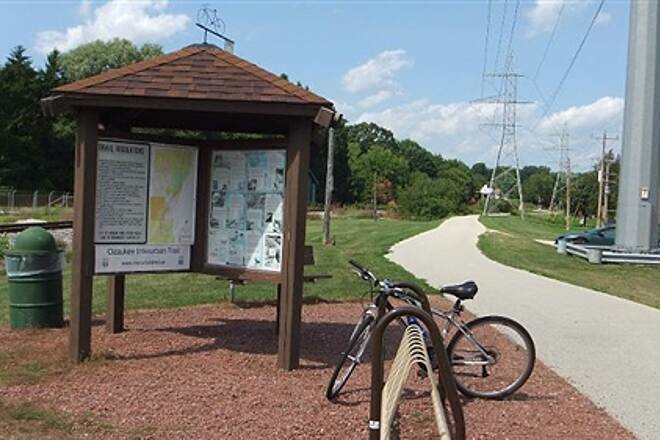 Another 3 miles reaches the Brown Deer Recreational Trail, which joins the Oak Leaf Trail and goes all the way to Milwaukee’s downtown waterfront. Public parking is available in Belgium, about 3 miles south of the northern endpoint in Cedar Grove. To reach the parking lot from I-43, take Exit 107 onto westbound County Road D. Go 1.1 miles, and turn right onto Beech St. Turn left into the parking area by the tennis courts. To reach the trail endpoint, head south on Main St., and turn right. 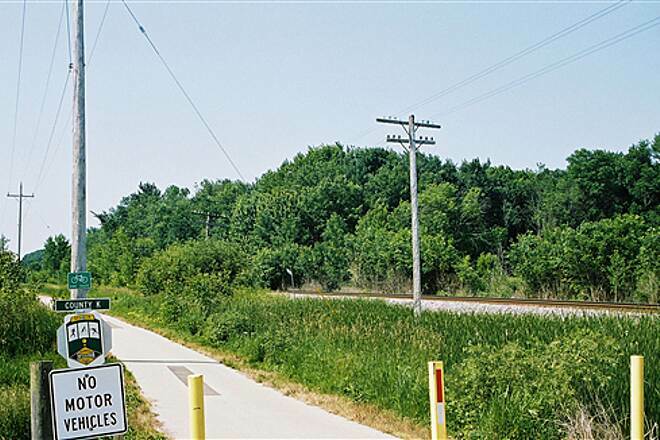 Go about 2 blocks, and turn right onto the Ozaukee Interurban Trail, located just less than 1 block past Elm St. Head 3.2 miles north on the trail to reach the endpoint at County Road K, which is also the southern endpoint for the Sheboygan Interurban Trail. 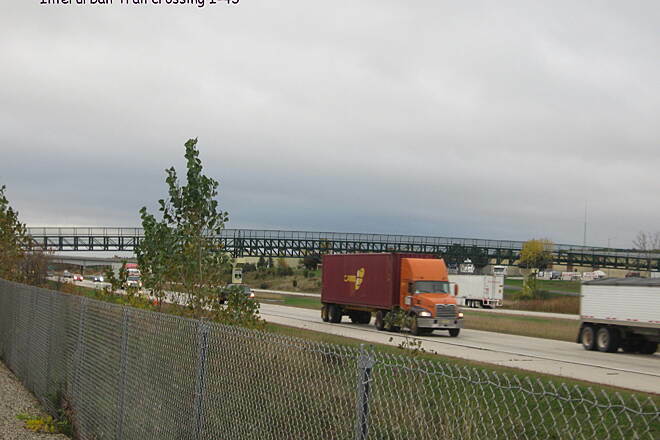 To reach the southern endpoint from I-43, take Exit 85 onto SR 57/SR 167/Mequon Road toward Thiensville. After 3.2 miles, turn right a half block past N. Cedarburg Road at a sign for city hall parking, and look for parking on the left. 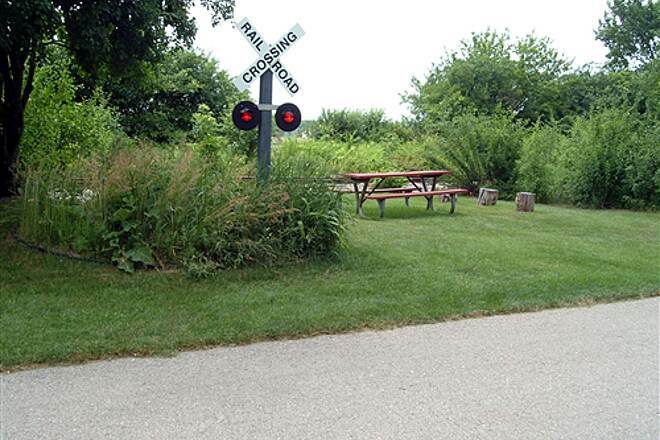 Go south on the trail for 2.2 miles to locate its southern endpoint, at W. County Line Road. On a recent trip riding trails from Chicago to Cedarburg, WI, we found this trail to be one of the best of the 10 trails we rode during our 6 day trip. It does cross streets, and drivers generally don't stop (although we thought pedestrians had the right of way in Wisconsin - the average driver doesn't seem to know that!). But the trail is in such great condition and generally goes through quiet fields and neighborhoods. We thoroughly enjoyed it especially after some very sluggish days on wet crushed limestone. We kept thinking how lucky all the people who live near that trail are and in fact, of all the trails we rode, this one had the most other trail riders/walkers/runners! A great half-day outing pedaling the Grafton to Cedarburg leg. 8 mile or so round trip, with five of us ages ranging 7-48. 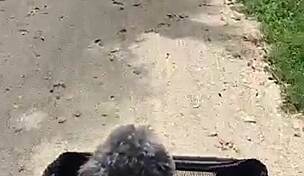 Easy ride, even for the rider with one-speed cruiser type bike. We started at the parking lot just south of the bridge that crosses the Milwaukee River...but backtracked a bit to get a great view of the river from the bridge. Had lunch at the Stilt House in the very walkable and quaint town of Cedarburg- don't miss it! You do have to wind through a couple residential streets and downtown, but signage keeps you on the trail. Keep a map or smartphone handy, in case. We started in Grafton and rode to the marina in Port Washington. It was the first road trail ride for my 13 year old son and he absolutely loved it! There are some hills, but nothing we couldn't handle. We had lunch in Port Washington and then rode back to Grafton. Very scenic... even got to see a pony on a farm! 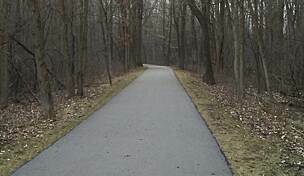 I recently tried out this trail and had a fun time.I started off of Mequon rd.and went to the I-43 bridge.That was 11.5 miles.The trail was interesting.I liked going through some of the small towns,then getting back on the trail.A few hills,and a few bridges and some interesting scenery.The only thing that I really disliked were the small bridges near Mequon.There were a few of them and they all had terrible transitions from the trail.You have to slow down or you will get a big bump.That was annoying,and I can't believe how bad they made that.It was a chilly 51 degree day on my ride,I will have to come back on a warmer day and make it to Port Washington. I have adventured multiple times on this trail and it has never disappointed. In fact. The last time we rode this trail was in February of 2017 for a 64 mile journey. 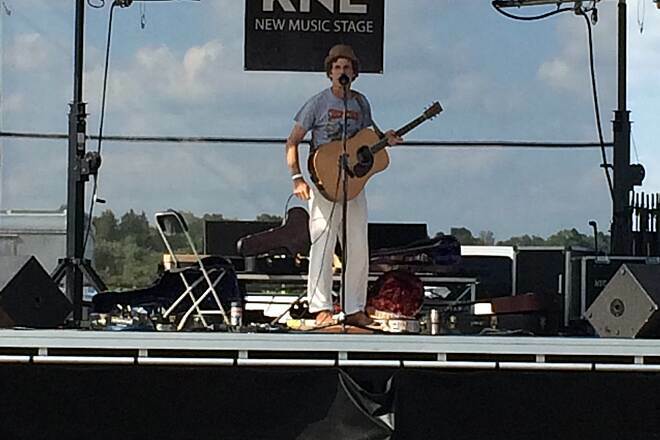 Each time we have started in Brown Deer Wi. and travel further each time. 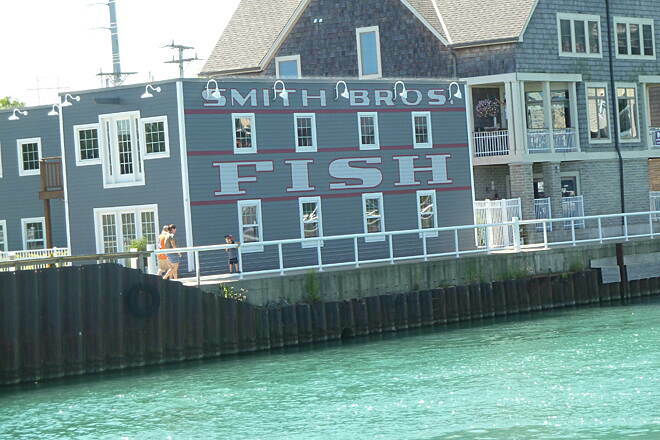 Port Washington is a great stop along the way to get some refreshments or eats or simply rest. A great recreational tourist area. The trail continues to Belgium Wi. were there is not much there. The trail is mostly flat with the exception of the the hill climb just north of Port Washington. The trail is asphalt and in good condition. The trail passes through a few towns about the typical 6 miles apart. 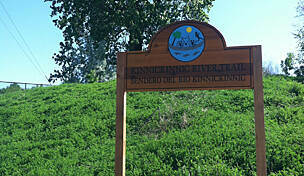 This trail is a great community link trail and for recreation. My husband and I just spent a few days in Pt. 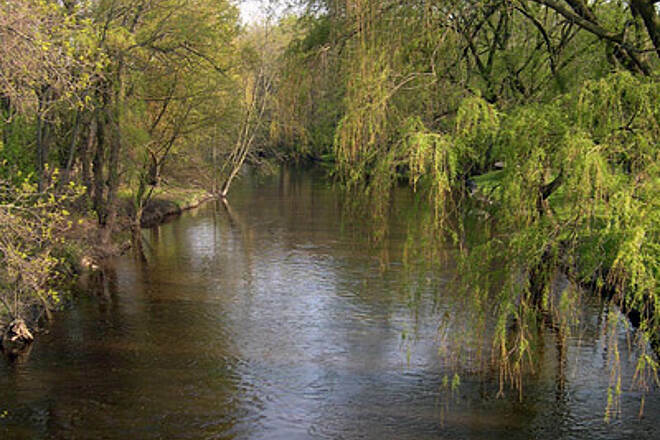 Washington riding the Ozaukee and it was a great experience. 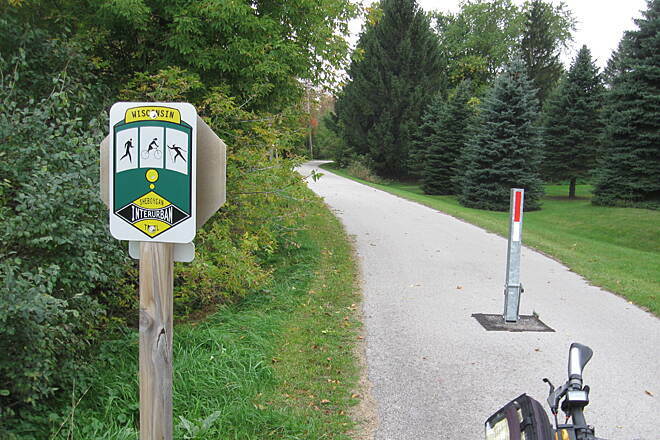 The entire trail has an asphalt surface which is well maintained. We stayed at the Country Inn & Suites because the trail runs right in front of the hotel. 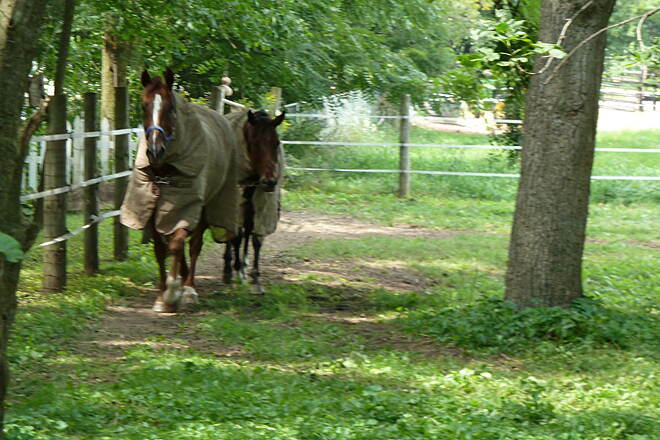 We arrived early afternoon and were able to jump on the trail and ride north to Belgium. The route is fairly flat but there are a couple of fairly steep inclines on this section. 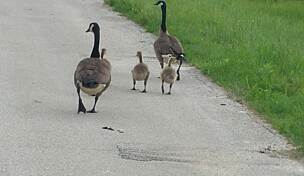 We encountered very little traffic. The blue skies and beautiful crops of wheat, corn, beans, and hay were very soothing, although it was quite breezy. Day 2 we parked in downtown Cedarburg, rode south to the county line, then returned, rested, had a drink, and rode north to Grafton. This section is much more urban and much busier. Some of the trail goes thru' the back yards of homes in town but eventually the trail goes through a wetland and wooded areas with a couple of small wooden bridges. It has a switchback in it reminiscent of the Breck/Frisco trail in Colorado, but it is still an easy ride. Day 3 We rode from Port Washington to Grafton going over the bridge over I43. 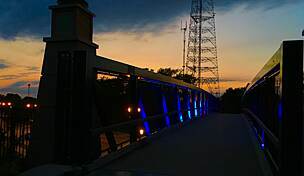 This trail is also urban/rural with some steep hills in downtown Port Washington - the highlight for me was the bridge as it is what caught my attention while driving thru' the area last fall. My wife and I really enjoyed this rail trail. We rode from the B&B that we stayed at in Port Washington to Grafton for lunch. The B&B was about 3 blocks from the trail and it was easy to find and follow. We rode the day before Memorial Day. We weren't setting any speed records, but we thoroughly enjoyed the ride. The trail wasn't crowded, but we were passed fairly regularly. 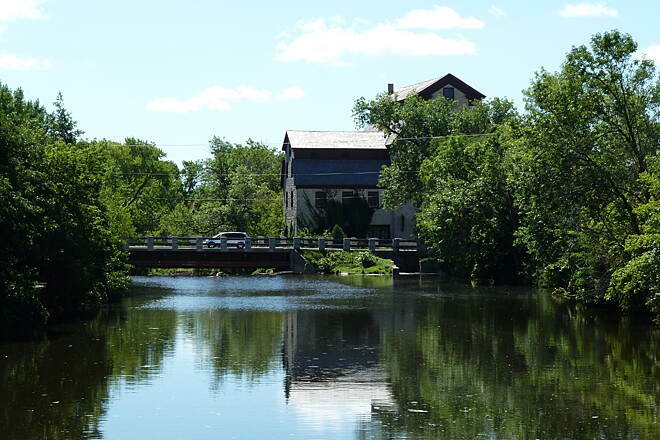 We stopped for lunch at the Milwaukee Ale House in Grafton, a few blocks off the path. It was across the street from Erik's Bikes so we were able to get a couple of things that we needed while we were there. The folks at the restaurant even filled up our water bottles for the ride back. The guy who helped us at Erik's told us that Cedarburg was totally chaotic for a Sunday festival. He had commuted by bike via the trail because he was afraid that he wouldn't be able to get his car back into town. 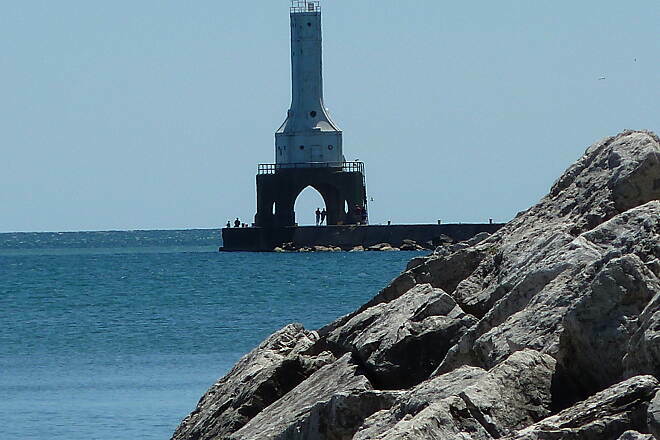 When we returned to Port Washington we rode the trail all the way out to Lake Michigan before locking up our bikes to enjoy the street festival that was going on in Port Washington. Apparently it was a bit less touristy than Cedarburg and there were plenty of places to lock up bikes in spite of the fact that a lot of people had ridden them to the festival. All in all the smooth riding trail with great stops on either end of our ride made it a great day! This is probably one of our favorite trails. 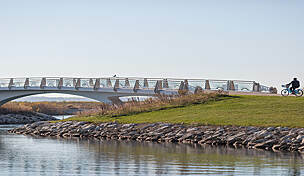 It connects to the Sheboygan Interurban. We like to ride our bike to go places and this gets us pretty far north without having to ride down country roads. This trail came through the winter very well. Pavement was in excellent condition. No major problems even where they put in new culverts. No large branches had to be removed from trail. No snow on this section of the trail. It was a beautiful day to bike. We made a 60 mile round trip and wished we had started earlier so we could have went further. As usual, people were friendly. Be prepared for the significant temperature drop at Port Washington, a real nice town. The temperature drop happens unbelievably fast. It's cold there even in summer. 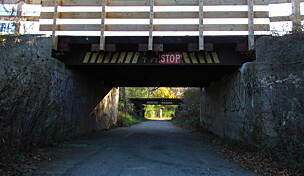 After Port Washington there is a safety fence to slow you down when crossing railroad tracks in a valley. We have to walk our long tandem bike through those sharp turns. My husband and I are fairly entry-level bikers and found this trail to be excellent! We hopped on the trail at Fireman's Park in Merton and cruised from Mile 13 - Mile 6 (just past Sussex). It was gorgeous. The paved trails made the ride a breeze. The path is very clearly marked, we never felt like confused about where to go. We will definitely be back - next time earlier in the day so we can make it all the way to Menomonee Falls and back before dark. Really enjoy this trail. Great way to go to Port Washington Lake Front. Enjoyed riding over the expressway on the bridge. 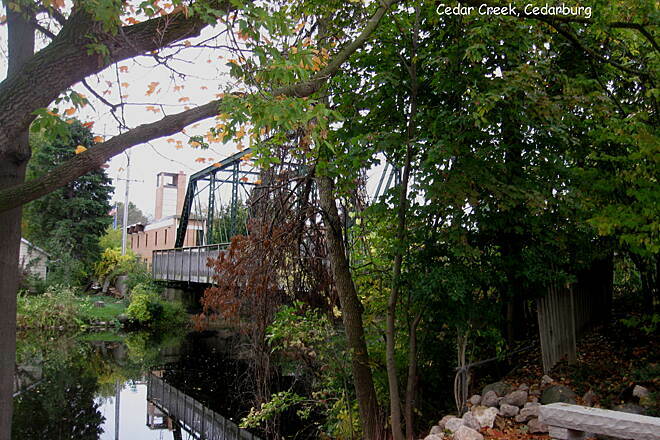 Also neat bridges in Cedarburg. Cars in Cedarburg very friendly to bikers even with rush hour traffic. Signage pretty good through Cedarburg. Need map in Grafton. Highway 60 very busy to cross but can go 1 block up to lights if you can't get across. Missed right turn on beech street right after left turn onto 1st ave that has well marked bike lanes. Beech street doesn't have marked lanes. If you get to traffic light with graveyard on right you will need to backtrack. Beech street is a nice wide street and takes you to 11th avenue. 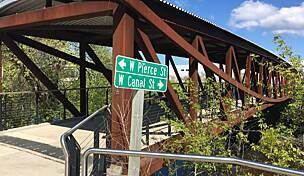 Maybe the river loop would have connected up to through bike route? Over all route pretty much follows power lines and mostly runs along a live railroad track. Dangerous railroad crossing is well marked and fenced to slow you down but we couldn't make corners on our tandem bike. Need map in Port Washington but pretty easy to find trail when you lose it. very nice. some turns not marked well when in cities. you need to watch map or will lose trail. This trail is exceptional, but would be 5-star if it were maintained all year round. Conditions in winter make the path frequently impassable, even with a fat tire/snow bike. This trail would be that much more useful if it were 4-season. This trail really gives one a historic feel of the vanished Interurban Era. Following the route of the Milwaukee Electric interurban, it rolls over open country and sneaks through alleyways in the larger towns. Unlike steam railroads (the basis of most rails to trails), the electric cars would climb steeper grades and twist and turn to follow whatever route was available. The Qzaukee Interurban Trail reflects that. 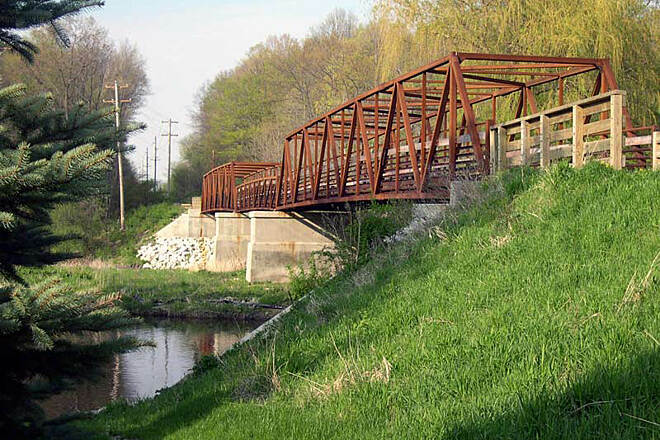 The trail website seems to emphasise the Ozaukee County portion, but give Sheboygan County its due... the trail extends to Oostburg, well beyond Cedar Grove. 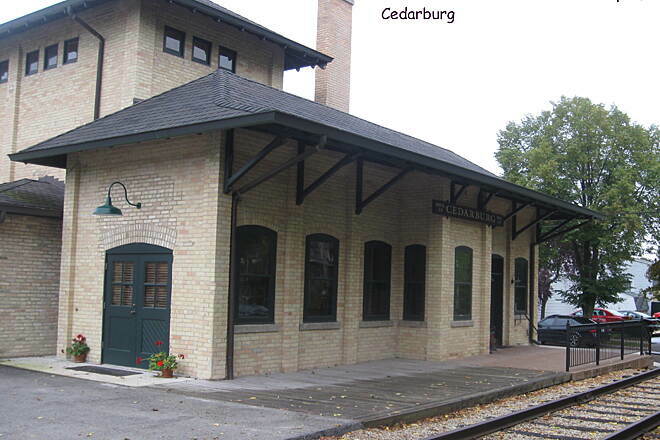 Beautiful depots remain in adapted-use form at Cedar Grove and Cedarburg. Enjoy this trail and imagine the whine of the traction motors as the cars climb the grades. The interurban trail is a great place to do a century ride. I've done this many times now (at least a few times a year for the past4 years). 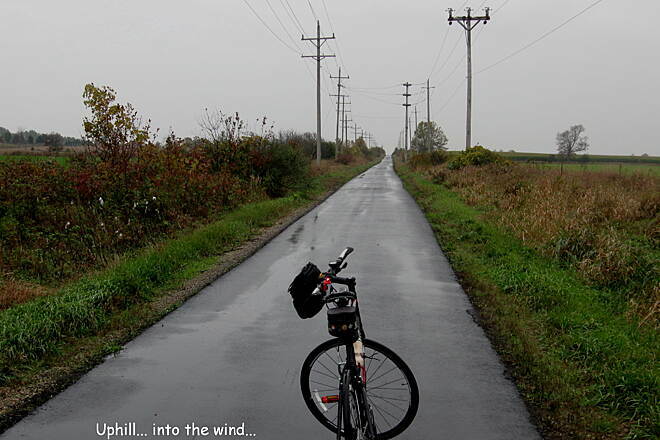 Typically, I'll start somewhere north of Belgium, and ride south to Brown Deer Rd. (the last mile was finally paved last year, so no more "muddy ruts" that other reviewers have posted about). When I get to Brown Deer Rd., I turn around had head north. 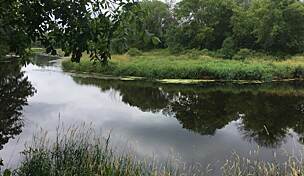 Once I gor to Ootsburg, I follow the bike route north (no linger the Interurban, but out on lightly traveled rural roads) to Down-town sheboygan where I turn around at the marina, and head back to my starting point. This ride covers around 103-107 miles (depending on my bike computer and food and rest-room stops along the way). The Great thing about this ride is that there are plant of good places to eat and stop along the way in the many little towns you pass through. 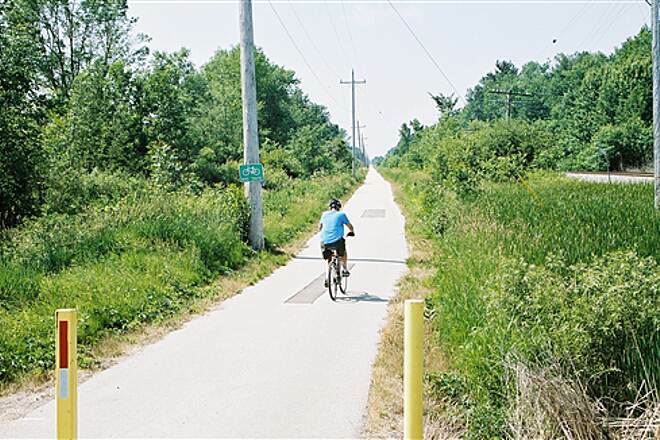 The southern half of the trail is busier, with the towns being closer together, and the northern half (north of Port Washington) is much quieter and less traveled until you reach Sheboygan (if you choose to try the century). Anyway, I'd give the Interurban 2 thumbs up. One of my favorite places to ride, and I'm looking forward to the 2010 season. My wife and I recently rode the trail from Grafton to Port Washington. We liked the fact that it is paved allowing for quiet, smooth and cleaner ride (if it rains). We are beginners and what we did not like was the fact that so much of this trail runs on roads, some of them very busy. 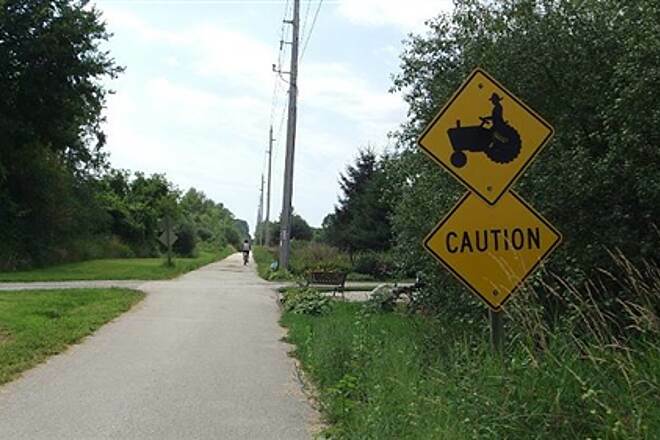 If you ride with small children be aware of the car traffic that will be on this trail. When you get into Port Washington you really have to keep your eyes open for which way the trail goes and with all the traffic to also watch for it was not a very enjoyable ride. I don't think we will be taking this ride anytime in the future due to the road riding, we can do that anywhere. This trail is awesome. I rode it from Oostburg to all the way to Brown Deer. Very beautiful ride, the trail is in great shape. Alittle hilly once you get to Port Washington up to Brown Deer. I had breakfast in Grafton, downtown is beautiful. I highly recommend this trail to everyone who loves bicycle! Recently rode about 10 miles of the trail from Thiensville to Grafton with a stop for lunch in Cedarburg. First time on this trail. Good trail for a casual ride... lots of slowdowns for streets. Cedarburg was very interesting w plenty of places to eat and browse. 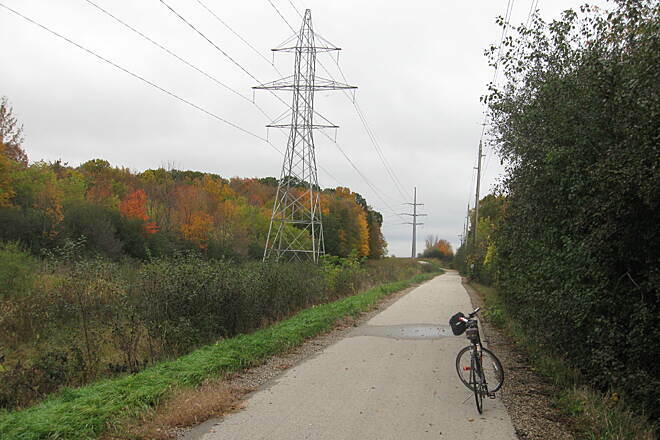 The power lines detract from the trail on the lower end. 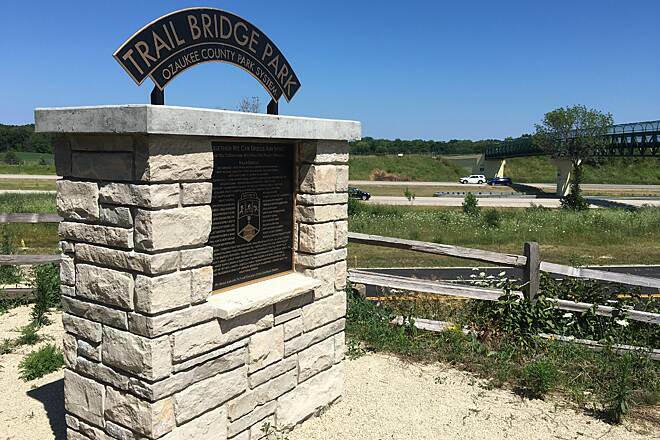 I always park my car in Brown Deer Park and ride to the Brown Deer Trail (not easily found)which connects to the Ozaukee Trail. 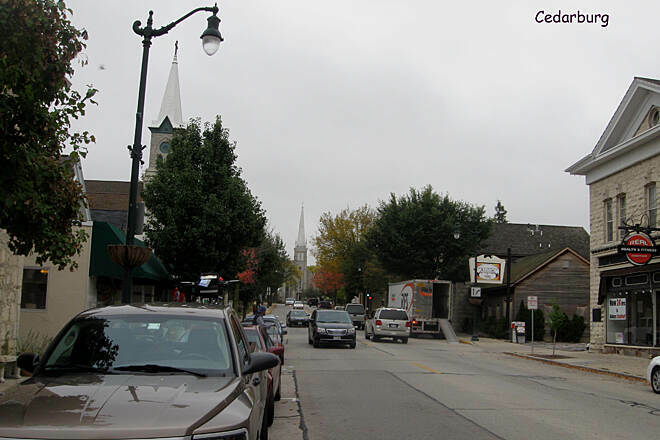 I love to lunch in Port Washington and stop at the Cedarburg winery on my way home for a bottle of their great wine. They'll even bubble wrap it for you. 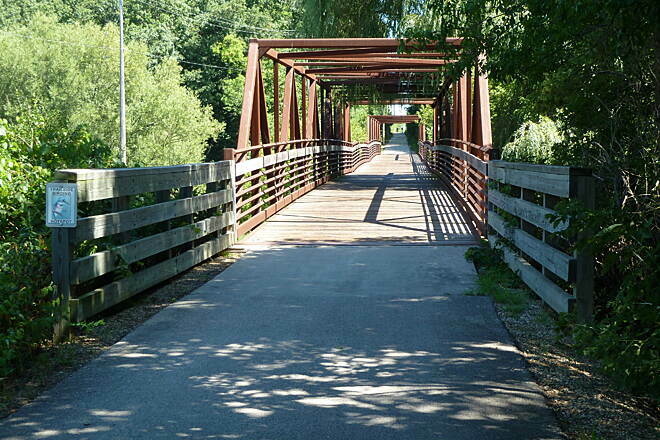 "We rode this trail from Cedarburg up to Port Washington. The trail is great, exceptionally well marked, some sections are on-road but traffic is light. "This trail doesn't offer any outstanding scenery going mostly through farmland and backyards in typical flatland suburbia. 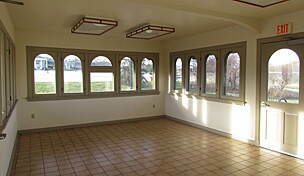 It has is charm, of course, but the high quality fairly young asphalt surface would be its main attraction. That changes once you have to go through towns when the old railroad trail routes are lost and stop signs are frequent, but it could be only small problem for in-line skaters my self, since only a few have the cars approaching anywhere close by. Some debris could be found here and there on the surface, which is ok for April, but overall the trail is clean, well maintained. The piece of old right-of way north of Grafton just begs to be converted, but since it's not, you go around this would be shortcut via some village streets. I started from Mequon (at the library) and had no problem to go Cedaburg. Looks like newly done section to me. 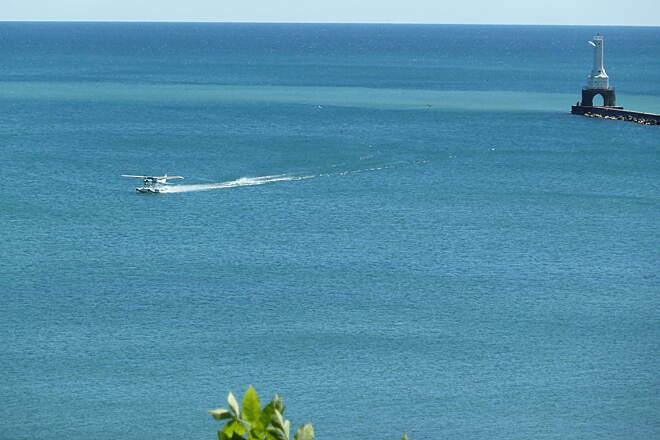 Very pleasant, easy and fairly long trip. " 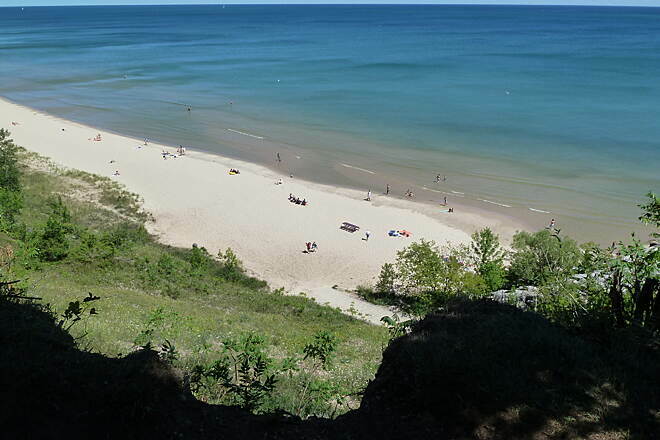 "This trail is close enough to Chicago for a day trip but far enough away for a real Wisconsin experience. 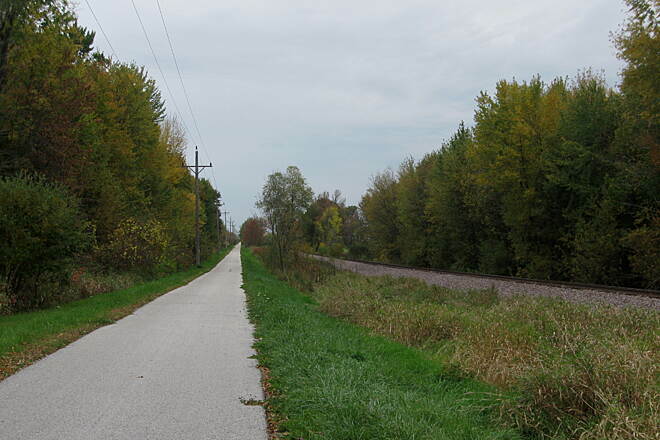 The 30-mile paved trail from Cedarburg to Belgium is a wonderful mix of bike trail and quiet back roads. 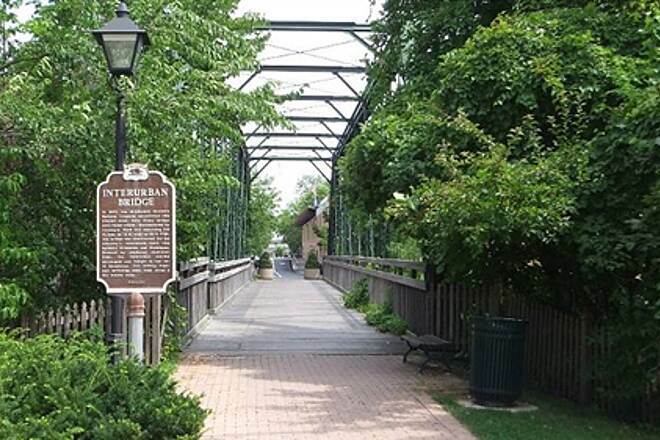 There are great little towns to explore along the trail with antique shops, restaurants and lovely parks. The trail was nearly empty on the day we rode, but the weather was very brisk and chilly. This trail will probably be more crowded on a warm summer day. We experienced temperature changes of 20 degrees as we rode from the relative warmth of the valleys to the very brisk winds along Lake Michigan in Port Washington. One word of caution: while the trail extends south to Brown Deer, Wisconsin, the portion of the trail south of Cedarburg is only partially paved and we encountered some really muddy rutted sections. 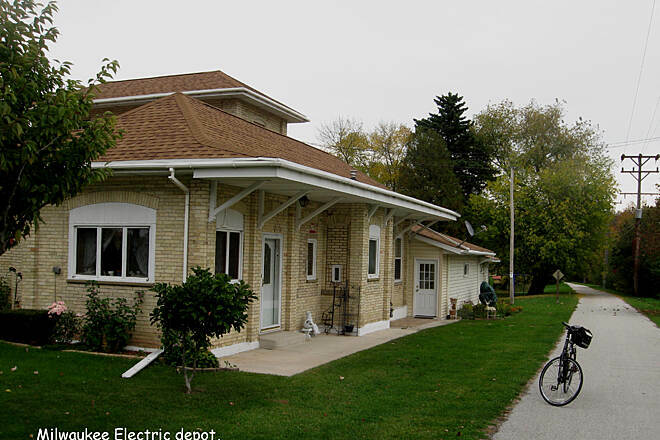 Start at Cedarburg and head north for a wonderful day of biking!"